Advertising is one of the most powerful forces shaping our lives. From the day we are born to the day we die, for every waking hour, we are bombarded with exhortations to buy. Advertising is the enabler of the consumer society, keeping factories open and people employed, and giving everyone a reason to get out of bed in the morning so they can work ever harder for more and more things that they don’t really need. Of course people have always advertised their wares and services on a personal level but it only became the giant, remorseless machine that it is now during the 20th century. For me the ‘golden’ age of advertising was probably the 1950s in America. A coincidence of booming post-war prosperity and the advent of television as an advertising medium created the perfect environment for the huge advertising companies to develop. They’ve never looked back since. 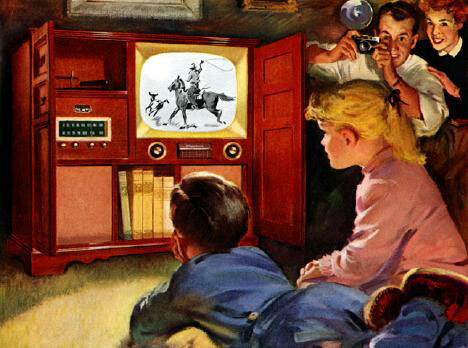 Television was reaching the masses of America during the 1950s (the first color sets hit the market in 1951) and it allowed the hard-sell to be thrust right into the country’s living rooms. Suddenly there was a fascinating array of must-have products that people had never realized before they needed. Whole programs were devised not for any artistic reasons but simply as a vehicle for selling. One of the best examples was the ‘soap opera’. These were ongoing, episodic works of dramatic fiction presented in serial format, originally on radio but transferred during the 1950s with great effect to television. The name “soap opera” stems from the original serials sponsored by soap manufacturers like Colgate-Palmolive and Lever Brothers. They were aimed at, and consumed by, a predominantly female audience and typically had weekday daytime slots when mostly housewives would be available to listen. With so much product to shift the advertising men of the 1950s couldn’t afford to encourage the old-fashioned values of thrift and prudence. The idea that you should only buy what you could afford, or save until you could afford it, simply wasn’t going to cut it any more. So people were encouraged to buy on credit. After all, if you could have that shiny new car or washing-machine right now why wait until you actually had the money for it ? 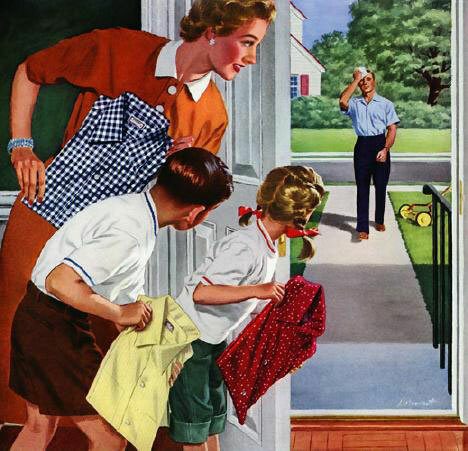 Instant gratification became the accepted way of life for Americans. Its no surprise therefore that the credit card system was introduced into America in 1950 to allow debt to be acquired in the fastest and easiest possible way. 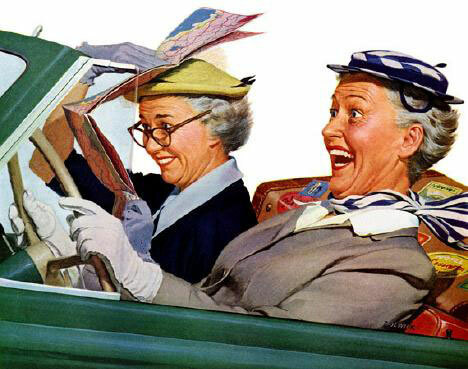 Speaking of cars, there is possibly nothing that symbolizes America in the 1950s as perfectly as its cars. It was a time long before the global dominance of foreign car-makers and bland corporate design, when you would buy a car made in the USA and choose from a huge range of genuinely different models. American cars of the 1950s dripped with chrome and had swooping tail-fins. They were extravagent, futuristic, and glowed in the bright pastels and primary colors of an optimistic age. Car advertizing in the 1950s was as unrestrained as the product itself, stressing the car as an essential part of the ‘American Dream’. America came out of the great depression of the 1930s straight into the hardships of the second world war and it took until the 1950s for people to feel secure and comfortable about the future. By then the average household income was nearly $3000 and almost 60% of Americans owned their own homes. It was the land of plenty and nothing was more plentiful than the food. 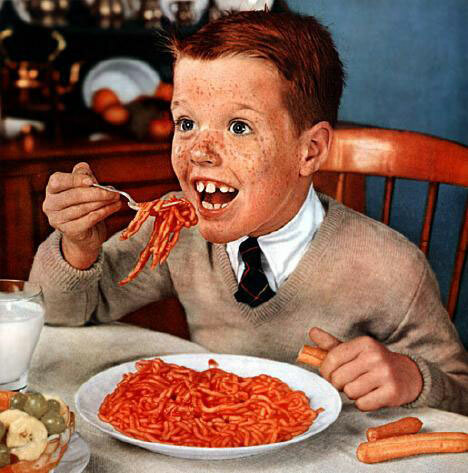 A still war-damaged Europe could only look enviously at the magazine advertisements it saw of plates piled high for smiling , milk-fed Americans with perfect white teeth. Of course in reality poverty and hunger was rife in large parts of urban and rural America but you would never have guessed it from the food adverts. 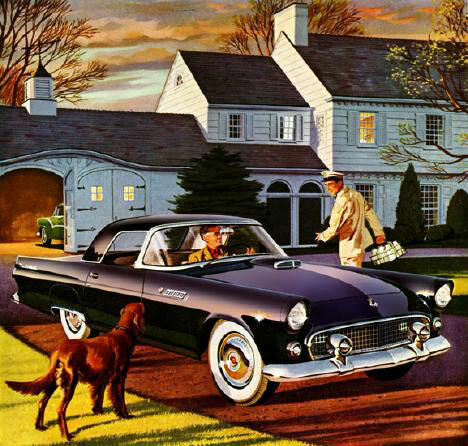 By the end of the fifties most American households owned their own car and washing machine and approximately 90% of them owned at least one television set. 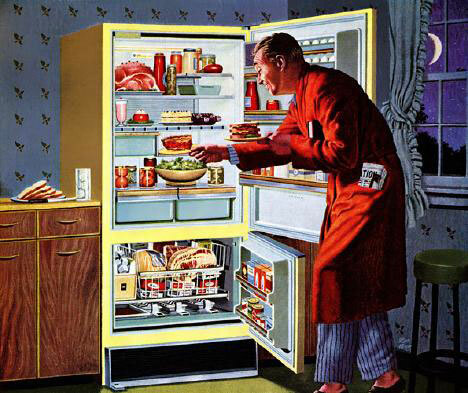 According to the advertising men you had to have a brand-new washing machine to keep all those new clothes clean and the latest, gigantic fridge so all the food they’d persuaded you to buy wouldn’t go bad. There was no end to the shiny new gadgets you needed if you were to keep up with the Joneses. Faced with this, people felt that they had to work ever harder so they could afford the labor-saving devices that would free up their time so they could work even harder to buy more labor saying devices. 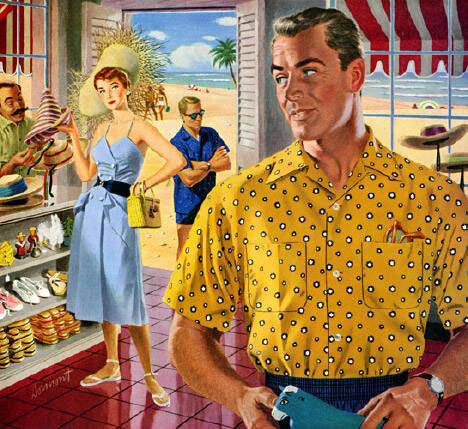 The virtuous circle of consumerism was perfected in the 1950s and has continued to grow in strength ever since. Working extra hard to buy so many new things, and the constant worry about ‘keeping up with the Joneses’ that advertising strove to engender, inevitably took their toll. 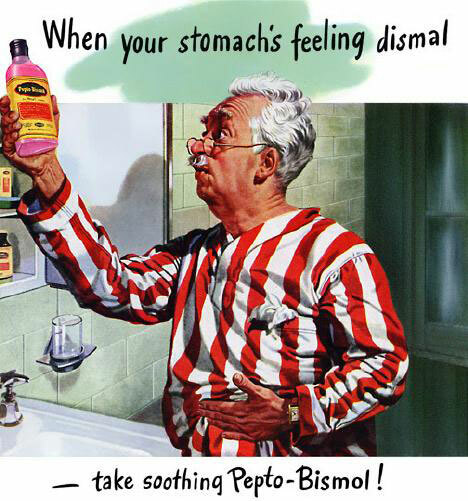 Fortunately the ad-men were right there to tell you about the health-giving benefits of smoking and how a little Pepto-Bismol could cure the indigestion caused by stuffing yourself with that over-abundance of food from your super-sized new refrigerator. People discovered through the medium of 1950s advertising that they suffered from complaints they didn’t even know they had and some that were, indeed, unknown to medical science. Dress an actor up in a white lab coat and hang a stethoscope around his neck and even the most bizarre claims became credible. There was no point in having all of the brand new shiny gadgets and the dream car and a super-size fridge full of food if you dressed like one of the Beverley Hillbillies so clothes figured large in advertizing. As with so much else the ad-men were selling a dream, that all it would take is a new Arrow sport-shirt or a new Dacron suit and you would get that promotion, you would be popular, you would be a hit with the ladies. For generations people had got by with only their work clothes and a ‘sunday-go-to-meeting’ suit that lasted for years but now they were introduced to the concept of ‘leisure-wear’ for the new-found leisure they had so little of because they were working so hard to buy all the new ‘stuff’ they were told they needed. 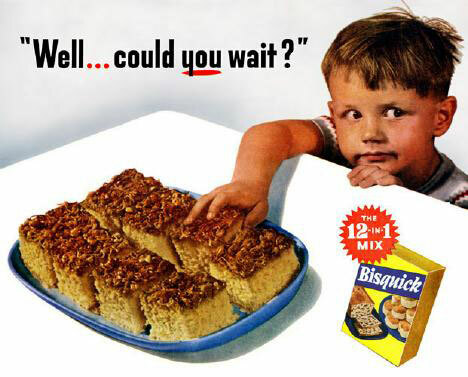 Never one to miss a trick, the ad-wizards of the 1950s relied heavily on ‘cute kids’ to promote everything from food to toys to .. well just about anything. Generally speaking the pitch was to guilt-trip the parent and imply .. “if only you buy these cornflakes or this soda or this toy then your child will be happier and healthier than it is now and if you don’t you can’t possibly love them.” Parents naturally found this line of argument irresistible. 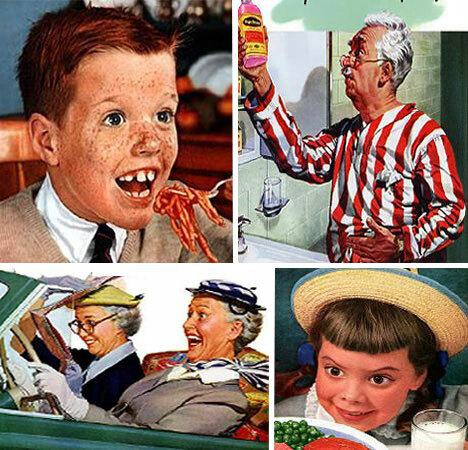 Personally, I find that a lot of the kids used in 1950s ads look positively demonic. They were more ‘perky’ and with bigger, toothier grins than anything outside of a Disney animatronic show had a right to be. But maybe that’s just seeing them from a 21st century perspective. One of the most interesting things about advertising from the 1950s, or any other time for that matter, is what it tells us about the society it was aimed at. Old ads often provide unwitting social commentary. In the case of this ad (for shirts) you can see that the basic premise is the nuclear family. Dad, Mom and the two kids all live happily together in the suburbs. Dad goes out to work and Mom stays at home to look after the children. That was the publically accepted norm in the 1950s and you wouldn’t find any ads pitched at single mothers or divorced dads. It was a different world then and the ads reflect that very clearly. This old ad from the Ethyl corporation captures the exuberance of the 1950s and the advertising that flourished then. After the dark post-war years it seemed as if the clouds had finally blown away from America and the sun was shining again. Everything was bright and colorful and exciting and, however young or old, you were entitled to have a good time. In some ways the picture the ads painted of mid-century America was accurate in capturing the spirit of optimism and aspiration. In other ways, of course, this picture was a gross misrepresentation and ignored the darker side of 1950s America, the poverty, apartheid, rigid conformity, intolerance, corruption, and the vile McCarthy communist witch-hunts. 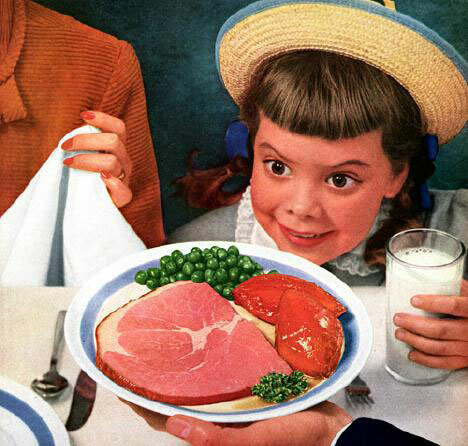 The ads of the 1950s were how America wanted to see itself though and, even if untrue, it wasn’t a bad vision.